This online course has been designed to provide knowledge and skills to learners who investigate and report & present evidence relating to incidents involving fire and/or explosion at Tier 1 and serves as an introduction to fire investigation. The course is designed for Watch Managers, Crew Managers and Junior Crime Scene Investigators (CSI). It does not qualify individuals as competent Fire Investigators, which is a much more advanced and specialized role. Successful completion will enable Watch Managers, Crew Managers and CSIs to make more accurate and effective judgments, considering their professional and legal responsibility. To successfully achieve the GATR Level 2 certificate of completion in Introduction to Fire Investigation you must complete an online training course followed by online assessments. During these assessments you must demonstrate competence in the criteria set by National Standards (SFJA) at level 2. This course can also be accredited by Skills for Justice Awards as a Level 2 Award in Introduction to Fire Investigation. If you wish to partake in the accreditation route, please contact us prior to course commencement. Be able to Investigate a fire within own level of responsibility. 1. The learner undertook all lessons and lesson activities provided on the course. 4. The course manager was satisfied that the learner undertook all elements of the course and is competent to be issued the certificate at Level 2. The document ‘GATR Online Learning Portal Guide’ provides information on how to access and enrol onto the GATR Online Learning Portal. You will normally be registered onto the online learning site and have immediate access to the course; however, you should follow any instructions in the registration email. It is very important that you practice navigating the site before attempting the course. Once you are familiar with the navigation and features of the site, you should navigate to the administration area, read any information presented there including the aim and objectives of the course. On completing the online course, you will be assessed in each learning outcome to see if you have understood the issues. Once you have completed the online learning course, you will have access to the Assessment area. This comprises of a Final Knowledge Check and Fire Scene Assessment. You must attain a percentage score of 100% in both; however, you will have 3 attempts at each. A course manager will have been tracking your progress throughout the process and he/she will have access to your results and participation. He/she will review these and sign you off as having completed the course. You may ask questions at any time. There is a discussion forum in the course administration area for this purpose. Your course manager will respond to your query as soon as possible. The course also has an interactive chat facility which will be open on at least two occasions throughout each course where participants can speak directly with the online tutor or course manager. Following sign-off, you will have access to the Certificate area on the site. You are able to download this certificate as recognition and evidence of successful completion of the course. You will not be provided any other feedback. 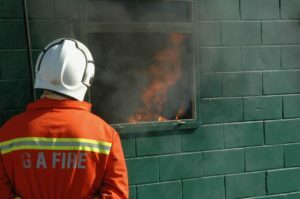 The course can be accredited by Skills for Justice Awards as a Level 2 Award in Introduction to Fire Investigation. The course has similar outcomes however there is an additional discussion module and different assessment rules. Enquires for multiple registrations by organisations welcome. Organisation co-ordinator As organisation co-ordinator please enter the details required below and press submit. Please contact enquiries@gatr.co.uk if there any subsequent amendments to these details. If you are an individual please fill in your details. Instructions We place students/candidates in cohorts of 10. Please fill in one form per cohort. If you are individual please fill in your details again. Learner support Please select if any member of the cohort is likely to require assistance. Please state what adjustments may be required to allow the student/candidate(s)to complete the course. Course date Cohorts are automatically enrolled in the course and individuals will be notified when the course commences. Please select a preferred date for the cohort to commence the course.